Don’t Let That Niggle Become a Nightmare! Invest in your future health and prosperity by getting a thorough shoulder health check. Unfortunately, boilermaker Craig left it until it was too late…here’s his sad story. Warning All Trades – The BIGGEST predictor of a shoulder injury is the one you’ve had before. Heading back to or continuing to work with a shoulder niggle is just asking for trouble. Take my advice, don’t do it. Likewise, understand that heavy lifting, repetitive arm tasks, working overhead and in awkward spaces or difficult positions can increase the loading and wear and tear on your shoulders. Making them susceptible to injury. 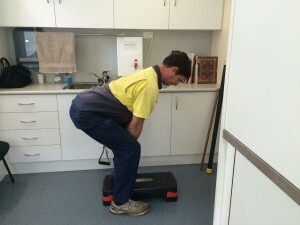 It just makes sense that if your doing those types of activities at work then you should do yourself a favour and check your technique, get assessed so that you know the path you’ve got to take to either manage your injury or get rid of it once and for all. Starting from a solid baseline makes sense. A Tradies Shoulder Health Check gives you a clear picture of your current deficits and physical road blocks preventing you from everyday pain free shoulder function, building muscle, increasing force production and reducing your injury risk. If we get time (and we usually do) we’ll dive straight into some of the building blocks of a strong and reliable shoulder. You’ll go away with an individual action plan to tackle your shoulder problem head on. But the majority of people, upon discovering their risk profile book a follow up consult to start their corrective shoulder physiotherapy immediately. Your Tradies Shoulder Health Check is $185. PS: What would be the impact on you and your family if you had to stop work because of a debilitating shoulder problem that potentially could have been sorted out long before? Don’t Wait – Book Now.